For the past 6 years, I have been living in Maryland, however, up until last Monday, I had only been to Annapolis twice. Once, I was there for a track meet at Navy, the second time, Bucky and I went to see Phil Vassar at Rams Head. While both times, I could tell Annapolis was probably really pretty, I never got to actually experience anything other than the inside of a gym, and a concert hall. Even though this time we didn't get to do too much exploring either, I saw enough to know it is an adorable town with lots of places to shop and eat. A little "hoity-toity", but cute, nonetheless. Anyway, recently, a very good friend of mine moved to Annapolis, so a couple girlfriends and I drove down (over, up..? I need a map of Maryland) to meet her for a lunch date. After driving around for a little while trying to find a parking spot, we finally found a good one, and walked towards the restaurants. We opted for McGarvey's, a bar and restaurant with a "saloon-like" feel, that was voted Best Bar and Best Raw Bar from The Capital Newspaper in June 2011. These awards make me a nervous blogger who thought she had a good palette. Although I guess it didn't win an award for "Really Delicious Food", so that makes me feel a little better. I guess you can guess where this post is going. We arrived and sat at a 4-top right near the bar. Our waiter greeted us after some time and we ordered our drinks. (First piece of advice, albeit minor -- when you serve fresh brewed iced tea, make sure there is enough ice in it to where it doesn't melt by the time it comes to the table.) We opened our menus and began to discuss appetizers. 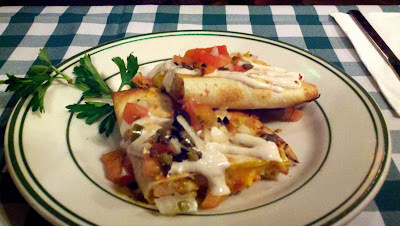 After a couple minutes, we decided on Crab Dip and Shrimp & Bacon Quesadillas. I told the waiter what we wanted, and kindly added, "unless you have any other good suggestions." "No, those are okay," was all he said back. (Second piece of advice -- talk up your menu. If you have recently won praise for being the Best Raw Bar, let customers know that and suggest your raw bar choices. It shows the table you are knowledgeable about your restaurant and that you are interested enough in their table to make suggestions for them.) Good thing we picked correctly -- our appetizers were absolutely delicious. Very small portions, but very tasty. The quesadillas (2 triangles) were packed with perfectly seasoned shrimp, roasted corn, fresh chopped bacon, and a combination of peppers and onions. They were grilled to a perfect crisp, golden brown, and finished with a chipotle sour cream. MM, so good!! The crab dip was also really good. I couldn't find a lot of crab in there, but with the blend of creamy cheeses and Old Bay, it really didn't matter to me much. Although it might matter to others, so my third piece of advice is, even if you only use a few colossal lumps, rough chop them, and throw them in there. Even if it's not a lot, it will make your customers feel like they're eating actual crab dip and not just cream cheese. Another way to amp up crab dip, is make it a "crab and shrimp" dip... so you can use less crab meat, a few pieces of rough chopped shrimp, and then it'll be more exciting and more lumpy. Now, on to the food. After we ordered the appetizers, it took us a really long time to order food. After we all looked over the menu, time and time again, no one was able to come up with anything, really. We all finally looked at each other and realized we all needed about 3 more pages of menu. There weren't a lot of choices that seemed appealing, and there were probably only about 5 actual entrees on the whole menu. I wanted to ask for the Dinner Menu, but that was it. So, I picked the most appealing thing based on the description. I opted for a French Dip sandwich, served with au jus and melted Brie cheese. It was between that and the Artichoke Chicken Salad on English muffin halves with melted Muenster. Since I couldn't decide, and neither could anyone else, Stehle got the chicken salad and we split our sandwiches in half. Lili got the same sandwich as I did, and Anne got a Grilled Salmon Salad, because she is always concerned about the way her pants fit. More power to her, I'm jealous of her willpower! I had a feeling I wasn't going to be thrilled with my choice (because I cannot make decisions whatsoever!!) so I opted for a bowl of the New England Clam Chowder as well. 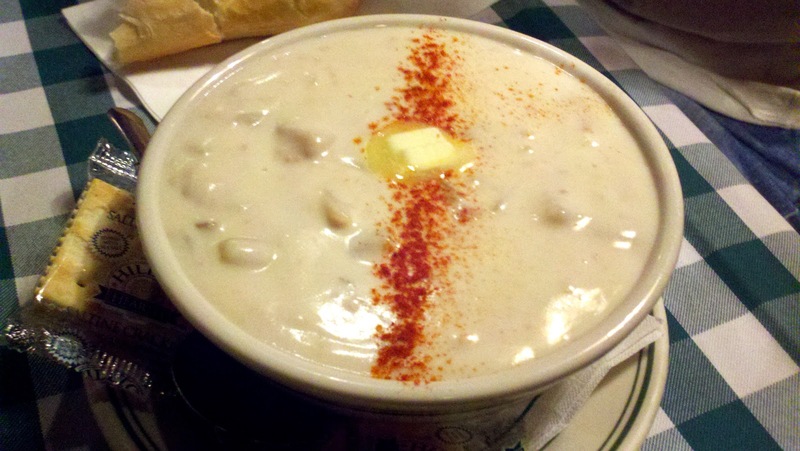 The clam chowder came out with a sprinkled line of paprika, and a dollop of butter. Truthfully, they could have shaken the entire paprika bottle on there, and added the rest of that stick of butter, and I still don't think it would have helped this soup. It was packed with bland boiled potatoes, not very many clams, and even less flavor. If I could have had a conversation with the chef, I would have asked why there were no spring onions, why there was no hint of smokey flavor, like bacon or pancetta, and why was it so incredibly thick? There was no celery, no spices, and no freshness whatsoever. It was like eating a bowl of flour and water with some boiled potatoes floating in it. My fourth piece of advice would be to make sure you are executing food with the freshest quality you can. This soup could have had fresh vegetables in it, like the celery and onions, it needed a few pieces of crumbled smoked pork flavor (pancetta or bacon), and some fresh herbs, such as a bay leaf, thyme, or parsley. Customers know when they are getting freshness. Our sandwiches arrived a while later. One of the only things I liked about my sandwich was the Brie. And that's because we all know my extreme love for cheese. It came out only slightly warmed, and neither the au jus nor the fries were hot. However, I will say, the "fries" were actually quite good. They were fresh-cut potatoes, cut into about 1/4-inch thick rounds slices. They were fried like French fries, and seasoned with a little salt and pepper. That was about the freshest thing I saw on any of the sandwich plates. The chicken salad was pretty good. I mean, it was chicken salad, I could have taken it or left it. The artichokes added a nice touch, though. Anne seemed to really love her salad, and she probably got the best thing on the menu. It was a nice portion of grilled salmon, however it looked like it may have needed a little moisture, like a drizzle of olive oil, butter, or a squeeze of lemon. It came on a slightly smaller than necessary plate, making it hard to eat. Lili got the French Dip, too, and she hated it. I think she had about 3 bites. Maybe we just didn't order the right things, but my actual lunch was disappointing. I would definitely go back to McGarvey's for their appetizers and probably for their nighttime bar scene. It was an attractive place, lots of exposed wood, a nice bar, lots of aesthetically pleasing plants and decorations. I actually just went onto their website, and they seem to have a lot of good specials. McGarvey's wasn't a total bust... I just think their menu could use an extreme upgrade, they need to add a lot more fresh and better quality ingredients to their food, and teach their servers to let their customers know about the awards of the restaurant, as well as good food choices on the menu.